When it comes to the vehicle that you will drive, you deserve nothing but the best. When it comes to that vehicle's interior, you deserve something that will impress you. The Jaguar XE is a popular luxury performance sedan with an interior that you will find to be all that you want it to be. 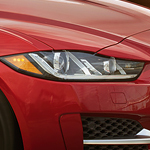 Every seat in the Jaguar XE is covered in a high-quality material that will hold up well. Every seat in this vehicle looks beautiful because of the covering on it and because of the way that the covering was finished. The setup of the dashboard is different in the Jaguar XE than in some of the other cars that you might try out. This vehicle has a dashboard that is set up in a way that adds to the overall spacious feel of the car and that helps you feel comfortable in the car.